Well, don't believe the hype. When you get past the rave reviews and web buzz, you'll find it comes down to one thing. How do two young designers get from a hunch that they can make a better to stylus to seeing that stylus appear in Apple's iPad 4 keynote? Well, they have the design chops for a start, Noel was already a National winner at the Dyson design awards. Andy could take you on a tour of every millimeter of the stylus; his consideration yielding an uncompromising technical edge. Accurate conductive tip for precise control. Soft Silicone Surface for contact with device. 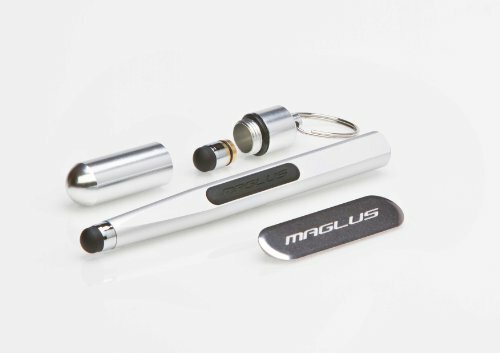 Keyring capsule for storing your spare tips so you are never without the use of your Maglus. Maglus is magnetic and clings to the side of your iPad. If you have any questions about this product by Applydea, contact us by completing and submitting the form below. If you are looking for a specif part number, please include it with your message.